This on-line repository of data allows users to download information on a wide range of macroeconomic variables to excel spreadsheets. This domain contains selected macroeconomic indicators for the Trinidad and Tobago economy. This domain contains major aggregates for the entire banking system including statistics on loans and deposits disaggregated by institutional sector (households, businesses, government etc. ), investment, credit, and broad and narrow money supply. This domain contains information for the commercial banking sector and includes statistics on loans and deposits by type and currency, credit and loan and deposit rates, treasury bill holdings and several other asset and liability items. This domain contains information for the commercial banking sector and includes statistics on total assets, loans, investments and interest rates. This domain contains statistics relating to activity in the local stock market It includes data on the composite index, the volume and value of shares traded and the number of transactions. 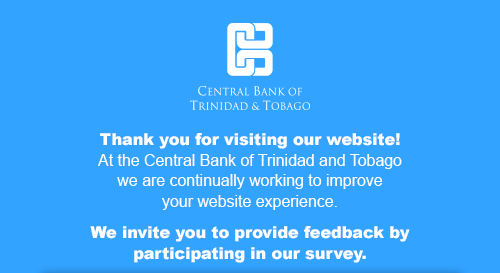 This domain contains selected indicators used by the Central Bank of Trinidad and Tobago to monitor liquidity. It includes statistics on Central Government’s net domestic fiscal injections, Commercial Banks’ excess reserves and Central Bank’s open market operations. This domain contains statistics on the country’s public finances and includes capital and recurrent expenditures, tax and non tax revenues, the overall fiscal balance and discount rates on treasury bills. This domain contains statistics on the country’s domestic and external debt. It excludes all private and non-guaranteed debt. The figures are based on the Central Bank’s compilation of debt statistics and in some cases represent an estimate using the latest available information. Due to differences in the reporting frequency of debt statistics by the Central Bank and the Ministry of Finance, only the fiscal year-end debt outstanding balances are formally reconciled each year between the two (2) institutions. This domain contains information on Trinidad and Tobago’s exchange rates with its major trading partners. It includes rates of exchange to the pound sterling, United States dollar, Japanese yen, Guyanese, Jamaican, Barbadian, Eastern Caribbean dollars and several other currencies. This domain contains data on foreign currency purchases and sales between the authorized dealers, Central Bank and the public. It reflects the US$ equivalent of trades in all currencies. This domain contains information on the country’s foreign reserve holdings such as the gross official reserves, net foreign position, total foreign assets and total foreign liabilities. This domain contains statistics on the country’s labour force, employment in selected sectors, as well as unemployment and participation rates. This domain contains information on the value of production in major sector of the domestic economy. This domain contains information on prices and includes the retail prices index, the producer prices index and selected energy commodity prices. This domain contains information for the insurance sector and includes statistics on insurance contracts, assets, gross premium and gross claims for life and non-life insurance companies. Figures exclude data from Colonial Life Insurance Company (Trinidad) Limited and British American Insurance Company (Trinidad) Limited. This domain contains information on the pensions sector and includes year-end statistics on assets, revenue and expenditure of pension plans from semi-annual financial statements. For periods prior to 2013, coverage of pension funds is approximately 80 per cent of the sector. For 2013 and all periods thereafter, coverage of pension funds is approximately 100 per cent of the sector. This domain contains information on the pension sector sourced from triennial actuarial reports. These data are grouped below according to reporting frequency of the various pension plans.